1976: President Isabel Perón, Juan Domingo Peron´s third wife, is arrested. Members of the arm forces take office to preserve public order. The facto goverment lead off to the repression of the political, social and syndicalist democratic forces. The coup d´etat result is 30.000 people disappeared. 1982: Falkland Islands war against England. A big mistake. War is always a mistake. 1983: Members of the arm forces are weakened and leave office. During that period, local and public debt had been doubled. December 1983: Raúl Alfonsín takes office and a new period of democratic government has been started. Military forces are prosecuted and a National Commission over the disappeared (missing) people is created. Hyperinflation arises. Alfonsín resignes due to the fact that another coup d´etat would have happened and the peronist Carlos Menem takes office. 1989: Menem starts a period of convertibility: 1 peso = 1 dollar. Companies are privatized and importing goods is cheaper than make them in the country. The industry is weakened due to the bankruptcy of many factories. Foreign debt is very high as well as the corruption. 1999: Radical Fernando de la Rúa takes office, in a country with a very difficult economical situation. Protest against a bank during "Corralito"
2001: Argentina enters in default. The "Corralito" starts: money can´t be withdrawed from the accounts. De la Rúa resigns due to the anger of people. 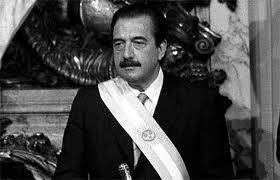 Peronist, Eduardo Duhalde takes office after having had five presidents in less than two weeks. A dollar climbs to 4 pesos. Money in the "Corralito" is also devaluated and the deposits show losses up to 75 %. 2003: Duhalde calls for elections. Néstor Kirchner wins the election. The economic situation starts getting better. The unemployment index is lowering and the economy grows in almost 9 points yearly. 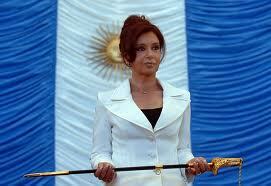 2007: Cristina Kirchner, Néstor Kichner´s wife, won the general election in Argentina . The country kept on growing based in the same economic model of Néstor Kichner. 2009: Although too much work is to be done, Argentina has been growing due to a favorable social and economic state of affairs in the country.